AlgAway 60 is a Chemical Algae Eliminator Formulated for Decorative Ponds & Fountains, Irrigation Ponds, Water Hazards & Retention Ponds. NOTE: For Decorative Fountains and Ponds WITHOUT Fish. NOT FOR SALE, USE OR DISTRIBUTION IN NEW YORK STATE, CALIFORNIA, AND CANADA. 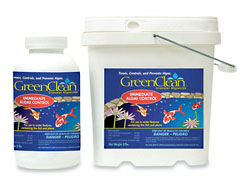 Decorative Fountains: ALGAWAY 60™ is used to control the growth of algae in decorative fountains that do not contain fish. Manually clean heavy growths of algae prior to treatment. Fountains with just visible algae growth require an initial dose of 1.0 to 2.0 fluid ounces of ALGAWAY 60™ per 1000 gallons of water. To treat a freshly cleaned and filled fountain, add 0.5 to 1.5 fluid ounces of ALGAWAY 60™ per 1000 gallons of water. For maintenance dosages, add 0.2 to 0.5 fluid ounces of ALGAWAY 60™ per 1,000 gallons of water every 5 to 7 days as needed. Make sure ALGAWAY 60™ is added at a point where it can be uniformly distributed. 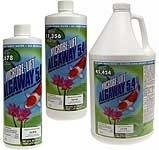 ALGAWAY 60™ may be used in fountains treated with chlorine chemicals, but do not mix ALGAWAY 60™ with concentrated dry or liquid chlorine products. Be sure to read and follow instructions on the product label.